Knowing when to go is hard for anyone… but it’s harder still, I think, for people in leadership positions. Leadership means responsibility, for one thing, and stepping down feels like abdicating that responsibility. Leadership comes with privileges, too, and we all know how hard they are to give up. More subtly, over time, leadership becomes a kind of engine that generates its own momentum: you lead because you lead because you lead. It can be hard to imagine hitting the brakes, even when they need to be hit, or (more to the point) turning over the wheel to someone else. Greetings. I’m Gwydion Suilebhan, one of the co-founders and the current artistic director of The Welders. We are a collective of five playwrights and one executive and creative director based in Washington, DC with a mission to produce one world premiere by each member playwright and then give the entire company away—website, checking account, board of directors, and all—to a new generation of artists… who will then do the very same thing, and so on and so on, far into the future. Our slogan is Three Years, Five Plays, Pass It On and as I stand here we have JUST finished the three years, five plays part. We’re now only a few short weeks away from passing the torch to what we’re calling Welders 2.0, and it’s very exciting. When we started The Welders, we were following in a “playwrights collective” tradition established by 13P in New York and the Workhaus Collective in Minneapolis, two really well-known groups of artists that started working a generation before us. But our model differed from both of theirs in one key way. When the playwrights in 13P finished producing each other’s plays, they held a giant “implosion party” and folded up shop completely, leaving behind only an elaborate set of instructions for anyone who might try the same feat. The members of the Workhaus Collective, by contrast, never intended to go away. They kept on producing each other’s work, year after year, for a long time, until they finally announced what would be their final production. We didn’t want to focus entirely on ourselves. We’d all been given a great deal by the DC theater community, and we wanted to pay that generosity forward to others. We wanted to build an organization that would outlast us… and, crucially, an organization that would outlast anyone who ever ran it. So we baked into the bylaws of The Welders the notion that leadership is always temporary. Each group of playwrights takes over, but only for about three years. 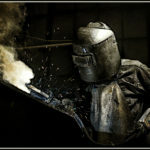 Those of us who lead The Welders know from our very first day in a leadership position that we’re only acting as stewards: that the organization doesn’t belong to us, but to others. The Welders belongs to DC. The Welders belongs to the future. And the reason we structured the organization that way? None of us wanted to create another bureaucracy. As those of us who work in non-profit arts organizations know, we’re all surrounded by bureaucracy all the time. And we’re all creative people! It’s crazy! So we wanted to build a platform that would easily and naturally evolve as each new generation of artists took it over. So the fact that we all expect to be leaving three years after we walk in the door makes us, to some degree, permanently in transition… and that awareness of transition has made us very good about preparing for it. The second generation of artists joined us in an observational capacity a YEAR before their term will start. They’ve been adjunct members of the collective for the last six months, too, actively working with us and learning the ropes. And when they take over, we aren’t going to leave, either. We’ll be serving as an advisory council, helping them for at least their first year in a variety of ways. Because our goal, at the end of the day, is evolution, not disruption. We want and expect things to change for The Welders, generation after generation, but to change smoothly. Interview leadership candidates differently. Don’t ask potential leaders whether they want the job or not. Ask whether they want to DO the job or not. There’s a difference. Anyone who says they want a job is looking (I worry) for a prize: a reward for a prior career. It’s a self-interested way of thinking. Anyone who wants to do a job, by contrast, is looking to get things accomplished. That’s selfless, and that’s what you want in a leader. Plan your end from the beginning. Too many leaders enter a new job without imagining how that job might one day be done. Those of us who run arts organizations, or even departments within those organizations, really ought to ask ourselves—before even taking the reins—what needs to get done. We should set goals, set a timeline for achieving those goals, and plan to get out when they’re accomplished, turning the organization over to a new leader with new ambitions. Think like a steward, not an owner. Ask yourself whether you can imagine whatever organization you lead still existing several generations into the future. (If, in fact, it still needs to exist; not all organizations are meant to last forever.) If you can imagine that future, then challenge yourself to leave that organization in better shape than you found it. Your work is a gift to the people who come after you; make it a good one. Talk about transition on a regular basis. There’s a kind of stigma about leadership changes. We’re all allowed to whisper about them, but we discuss them in the open all too rarely. We can and should de-stigmatize the conversation by checking in about the subject on a regular basis. Annually, perhaps, or maybe every two or three years. My hope is that we’re achieving all of these things with The Welders as we prepare to pass the torch. (Literally, in our case: we have a symbolic welders’ torch!) Here’s hoping we all continue to handle transition well.